Tropical Attitude Pets is the home of some of the sweetest Sugar Gliders in the country. My name is Steve Larkin and I have been raising Sugar Gliders since they arrived in the United States in 1993. I was USDA licensed shortly after I bought my first gliders and have been ever since. This site and our complete efforts are dedicated to the good health, well-being, and proper care of the animal we have come to love so much, the Sugar Glider. As well, we dedicate our efforts to providing a safe, trustworthy place for our customers to add this great pet to their lives. 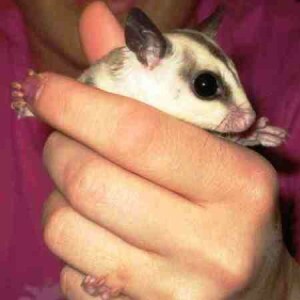 We also want this site to be a source of completely reliable information that our customers and Sugar Glider lovers everywhere can turn to for the health and welfare of their “Ultimate Pocket Pet”. We sell most of our babies at various trade shows so that we can have the opportunity to speak directly with the new owners and help them know just what they are committing to and to be able to teach them the basics of Sugar Glider care. All of the animals we sell at shows are sold with a proper cage and a complete starter kit to get the new parents off to a proper start. The animals come with a 17 day guarantee when bought this way, and every customer gets my cell phone number and direct email address for continuous contact. And, I answer the phone and return messages promptly!! etc. We have a great reputation for having very sweet babies. All of our babies are raised by us in our family owned and operated breeding facility. They are hand raised. 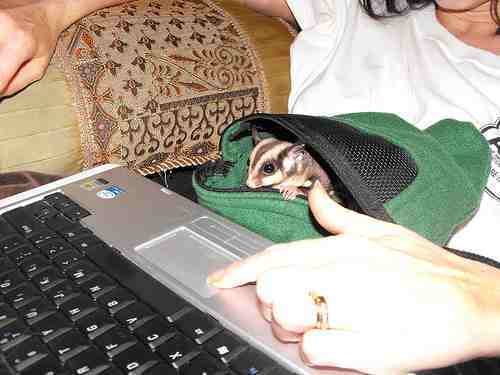 In addition to selling Sugar Gliders, we also rescue and find homes for unwanted Sugar Gliders. 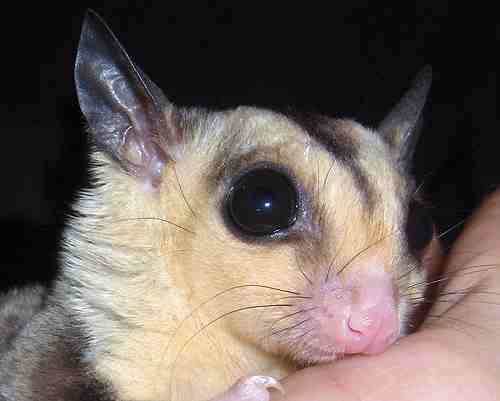 Most people who buy their gliders at the proper bonding age (7-12 weeks out of the pouch), love them and wouldn’t part with them for the world. However, not everyone buys them at this age and as a result, they are more difficult to bond with. Also many people buy them sight unseen, and don’t receive what they thought they were going to get. Others love their gliders but life takes an unforeseen turn and they have to part with them. Whatever the situation, we are willing to help find the best home possible for these “orphaned” but lovable creatures. By the time we take our gliders to the shows, they have been handled daily for about 5 weeks. As a result, most are not afraid of humans in general, but need a little time to acclimate to a new persons scent. Normally, at a show, they are sleeping quietly in your hands within 10 to 30 minutes. If you follow our bonding information, they usually will be completely bonded in about 2 weeks. If you are ever buying face to face, do not buy the gliders if you are not permitted to pick out your animals and hold them in your hands. Be sure to read the recent posts at the right of this page for more complete information on various subjects concerning Sugar Gliders. Here you can learn all you need to know to decide if a Sugar Glider is right for you, how to pick a glider, how to care for them, bond with them, and much more. At Tropical Attitude Pets, we take raising and selling Sugar Gliders very seriously. We consider it a sacred trust to always have the animals best interest at heart. We take great care of our breeder animals and consider them family. We only have as many breeders as we need to supply our sales. We consider “pet quality” animals to be 7-12 weeks out of the pouch, and try to sell all of them “face to face” to our customers, so that they can pick out the perfect match to their own personalities. When holding several babies in your hands you can feel the right ones because they cuddle up in your firm handhold and fall asleep or at least relax more than the others. We also pledge to offer only the best information on this website and in personal conversations. All information we provide is based upon our extensive experience since 1993 of raising, selling, loving, and nursing to good health, thousands of Sugar Gliders. We will tell you the good, the bad, and the ugly, but fortunately it is almost all good. There is a lot of conflicting information on other websites and in chat rooms. All we know is that our methods are easy, common sense, tried and true methods that have worked for us and for thousands of our customers over almost 20 years. Once you own your gliders you are responsible to care for them as you see fit, but we ask that you start with our methods first because they will get your babies off to a healthy and contented start. Be careful of self proclaimed experts, they usually have an agenda. We believe that it is very important for every glider to have the proper cage and basic supplies. We also know it is essential for every glider owner to have the proper information to get started when buying his/her new pet. In order to insure this, we only sell a customers first Sugar Gliders along with the proper cage and a complete starter kit. If a customer isn’t willing to provide these basic essentials they shouldn’t be buying a Sugar Glider at that time. You can learn all about the proper cages in our FAQ’s Section. This is our effort to insure that each of our babies have a chance at having a great life and that each of our customers will have a great experience with their new found companion(s). We will do our best to help anyone who has a Sugar Glider. You do not have to be a customer to access any and all information we possess. Please feel free to call or email if you do not find answers to your question on this website. If emailing, please ask specific questions. I will either answer you uniquely or send you one of our many reports on a subject that covers your question. I travel almost all of the time doing shows so please be patient for an email response. If you need immediate information don’t hesitate to call anytime.